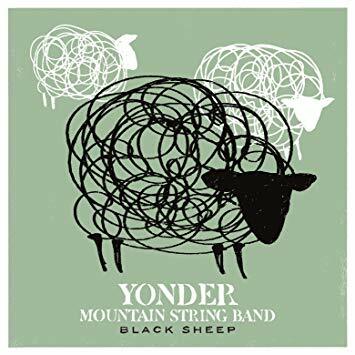 Yonder Mountain String Band returns to Greenfield Lake Amphitheater this Sunday, on tour with new album Love, Ain’t Love and nineteen years behind them. One thing became clear talking with guitarist Adam Aijala as he did laundry in Jim Thorpe, Pennsylvania – the band’s career has been consistently organic. Whether writing songs or becoming a bluegrass band doing it differently, they’ve always gone with the flow. Known for lively shows, they perform a new set list each night along with a range of covers. The habit helps keep things fresh musically; pulling from roughly 200 songs while doing a hundred plus shows each year. Influences come through on the new album – “Take a Chance on Me” sounds like a funky rock song stripped to its bare bones and instrumental “Fall Outta Line” is fun and mysterious. Initially it was meant to join songs as an approach to make a seamless album. The instrumental illustrates the band’s openness to creating, a let-it-be-what-it-will-be approach serving them well since forming in Colorado. Back then they played jam band festivals as a unique addition – a band without a drummer yet louder than other acts. Some traditional bluegrass-ers didn’t like what they were doing and left them feeling they didn’t fit in anywhere. Many recoiled from this NewGrass sound. “Fall Outta Line” is a great one from the new album. Aijala: I used to play it every now again, just sections when it was just me playing. Originally we wanted to make more or less the record seamless. That was one I thought was going to be a tweener – something that would have joined, twenty seconds at the most, two songs together. When we started playing it I thought it could be longer, its own song. It really came to light when adding the other instruments to it. Especially the counter rhythm the mandolin is playing; it was already weird, the obvious metal influence, when I got the idea. But adding the mandolin made it stranger, creepy. I never thought of it having lyrics, I never heard a melody, I guess there’s sort of a melody, but the lick it itself is the melody. I think it came out cool on the record. Covering “Dance in the Moonlight,” what made you want to give it the Yonder treatment? Up until Black Sheep the only covers we did on albums were songs our buddy Galloway wrote. We tried a Buzzcocks song on Black Sheep (“Falling in Love”) and it came out really good, fun to play. We always got a really good crowd reaction to “Dancin in the Moonlight.” It fits with the record, with some of the other lyrics, like the song “Groovin’ Away.” You don’t really think of the big picture when you’re gathering songs a lot of time, its not until after that you see the relationship. It just goes to show you can find a lot of things related without having to dig too far. Is recording a good or tedious process for the band, given your live shows are quite different? The thing about this record is that it took us between first studio sessions and mastering a little bit longer than a year. The most days we did at a time were three, and we’d go months at a time without working on it. Only Dave and I live in Boulder and we work with an engineer there and try to work everything around our touring schedule. We did a couple of sessions while on the road though those to be less efficient because you have to do the whole set-up. We’ve lost hours trying to figure that stuff out so generally we try to do it on one spot. It did take a long time to do but we took our time. When we did actual recording we worked as hard as we could but then took the time to listen to it and live with it a little bit. We really only had first session, four songs done, and some other ideas. Some of the ones that we thought were going to be tweener ideas became actual tracks. (Some) we have to write words for and they became what they became. When Yonder formed was there a consensus on what you should do musically? Were you more rebellious creatively then? No, probably not, the only difference where I’d say there’s some truth to it, it wasn’t something deliberate, it was simply because at the time we were playing jam band festivals and we were the only band there with out a drummer. But conversely, when we played bluegrass festivals we weren’t the only bands plugging in but we were the band that could get super loud. A lot of bluegrass-ers didn’t really like us, like traditional bluegrass. A lot of times we didn’t feel like we fit in anywhere. We didn’t fit into jam band, but they’d say we were a band that stretches out (songs), but they don’t have a drummer, it’s unique, we want them at our festival. Now there are all kinds of bands like that and that only helps the scene in general to grow. A lot of branches of bluegrass have formed. I think bluegrass was in dire need of a mix-up. A lot of people have been stuck in the rut of what Flat & Scruggs were doing back in the 60s. I think Del McCoury Band is about as quintessential as you can get, as far as traditional founding. I still love those guys, they’re the best and some of my favorite people. I don’t think we were intentionally rebellious. I’ve read about people mad about NewGrass. I’m a little confused by that. I am too. It’s a ‘these kids today’ kind of mentality. You can’t think like that. Even us, doing this nineteen years, we can even fall into that. But we’ve always gone with the flow if we can with the way the music scene changes, especially with availability of music – streaming and what not. Bands that are happening now, these guys are growing up listening to whatever band they want to and getting influenced by a million different bands out there. Then you put a pair of drums sticks in their hand or a guitar and their music is going to be influenced by whatever they’re listening to. Bands in general are getting more eclectic, at least that how it seems to me. Did you guys think twenty years ago, let’s do something different? No, it wasn’t intentional at all. In fact, when we first started playing together we wanted to be a traditional bluegrass band, hence the name. Once we started our influences began steeping into the originals we were writing. We were like, this doesn’t sound traditional so let’s not worry about it. Let’s just do what we do. I don’t anything we’ve ever done has been deliberate. It’s just based on how we’re influenced. There’s less musical freedom with making a bunch of money and people making money off of you. In general, we’ve been free to do whatever we want. If we’re not mainstream it means we’ll probably never be which I’m okay with because we’re still making a living playing music and loving what we do and never take it for granted. I think there’s an element of openness and everyone has ideas and it feels like we’re a team. If you go in with that attitude, that the reason we’re doing well because of all of us, not because of any one person, that’s a healthy attitude when writing music too. Twenty years on, what advice would you give your younger selves? One of the things I think about is that you’re no better than the people coming to your shows, and conversely, the people at the shows, they’re no better than you. Its something Dave and I were talking about recently. It’s true, you get a lot of artists thinking that because of what they do and people paying to come see them, that they are somehow more important. That’s not how I look at it at all. You know what, without these people I don’t have a job. But I think it goes both ways, sometimes people feel like ‘I bought this ticket and so on.’ It’s definitely a two-way street. Everyone has to be cool. I feel like we’ve done a pretty good job of maintaining good physical and mental health which contributes to the longevity of our band. We have the ability to talk to and be respectful to each other. We had a personnel change, especially since then, it’s been a lot healthier for everybody. Is a Yonder album the appetizer and the live show experience the actual meal? A blueprint, or springboard, for what the band really is? I don’t think that, I think that when we write a song, an ultimately an idea is an idea, I never really have a preconceived notion that it’s going to work or is it a chord progression, is it words, is it both, so the idea is whatever it is, I’m never writing with any intent. But you’re obviously thinking is this is a song that’ll work with Yonder number one, or could this be something you can stretch out into a live song. You don’t want to force it. We’re just playing by ear. I don’t really have a template, which makes it fun. No one is thinking, this song might fit well on the radio, or for a certain crowd or demographic. Does line-up changes cause a band to re-think itself, or do you accept it and see what new folks bring to the fold? We’ve never really done anything deliberately in a musical sense. But when you have…everybody is their own individual as a personality and it’s also true with their ability as musicians. Assuming you’re not just hiring someone to say I want you to do this every time, you’re giving someone musical freedom it’s going to be a different sounding band. Because everyone has their own musical personality. I’m psyched with the way its going, the more gigs we’re doing the more comfortable we feel on stage. I feel like a year ago, what we have considered a good show is now a mediocre show and a good show is that much better, from my perspective. I feel like we’re on the up, but that just comes with logging shows. That’s same way with any other band. Banjo playing just looks so hard and focused. Are there things about playing it most people don’t realize? Is it harder to learn than guitar? That’s a good question. When I look at people that play it I feel that way too, especially the people we play with, we know pretty much the best banjo players in the world. There’s Bela Fleck, and Andy Thorn is a friend of ours too, Leftover Salmon. I mostly play claw hammer, old time banjo, you’re not wearing picks out, and I can play with picks. They call it Scruggs style. I do a little of that, I’m less proficient on it, I’m much more comfortable on claw hammer. What’s a touring year like for the band? I’d say 100 give or take, for the last 15 years. We used to do more. How do we stay together? That’s how we do it. We do a festival outside of Portland Oregon, Northwest String, for 17 years now. The Saturday of it we’re doing the entire Pink Floyd Meddle album and we have our friend Jay on drums and Asher on keys. I’m going to play electric on some of it. That’s the newest thing. We just played a cool Etta James song “Damn Your Eyes.” Allie sang it. That was fun, funky. We try to play it like the record but with our own stamp on it, stretch stuff out more. We fly home the next day (after the Wilmington show) to rehearse for that Meddle show.